Freeze dried strawberries, and various other berries, come in whole fruit and powdered forms. They are simply freeze-dried, so have no moisture in them what so ever, with no added ingredients – just 100% strawberry. The same kind that you sometimes find in breakfast cereal – and are perfect for flavouring creams and custards without adding the sogginess that fresh fruit would emit. 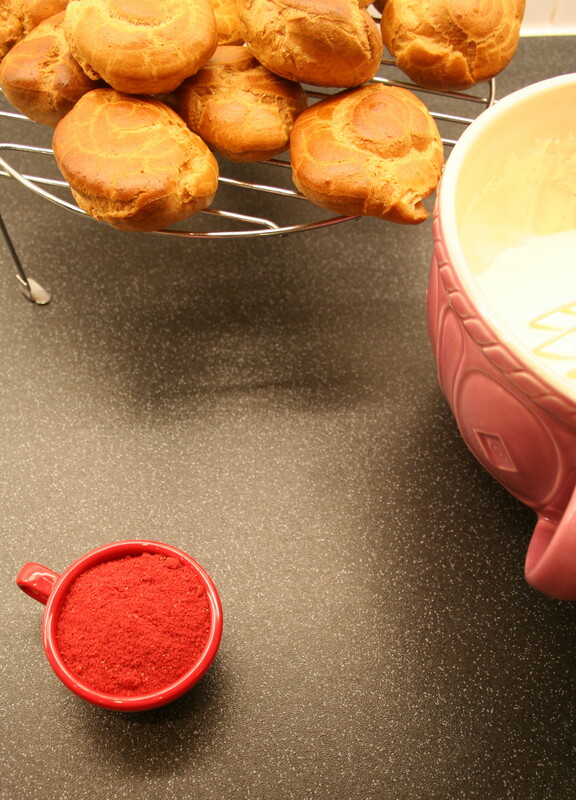 Never did I think that making the choux pastry would be a bigger hurdle than obtaining the freeze-dried strawberries. 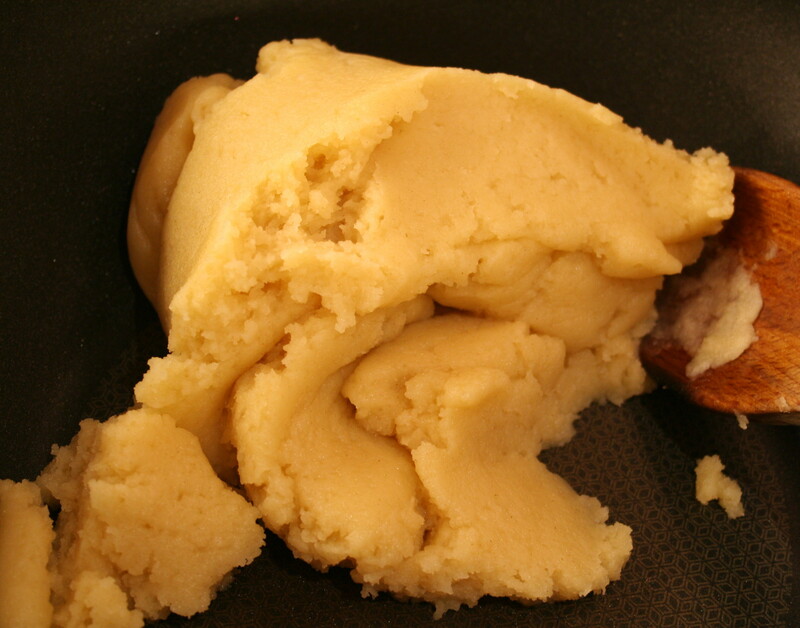 Pâte à choux, or choux pastry, should be an easy, and rather uncomplicated pastry to make. 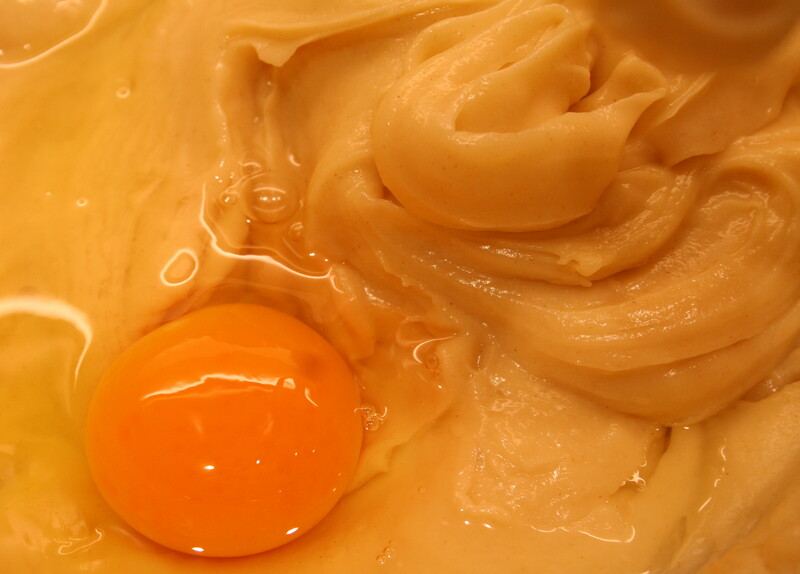 Melt butter, sugar and salt in water, stir in flour, beat in eggs and ta-da you have silky smooth choux pastry. I remember watching my French friend Philippe whip it up in minutes, and bang it into the oven only for it to emerge as golden, puffy balls of perfect pastry. Simple. However, my first few attempts at making this pastry deceptively ended in pure disappointment. I pulled the baking tray out of the hot oven – after giving the golden puffs an extra five minutes in the oven – only for them to deflate into soggy disks as they cooled. And it was a Michel Roux recipe – no doubt tried and tested by the French pastry genius, and thousands of others. I gave the next batch I made and extra ten minutes in the oven and they behaved exactly the same. Having baked all evening, and feeling somewhat defeated, I threw the lovingly baked, soggy mess into the bin, turned the kitchen light off and retreated to bed near midnight to sulk. I was done with choux pastry. 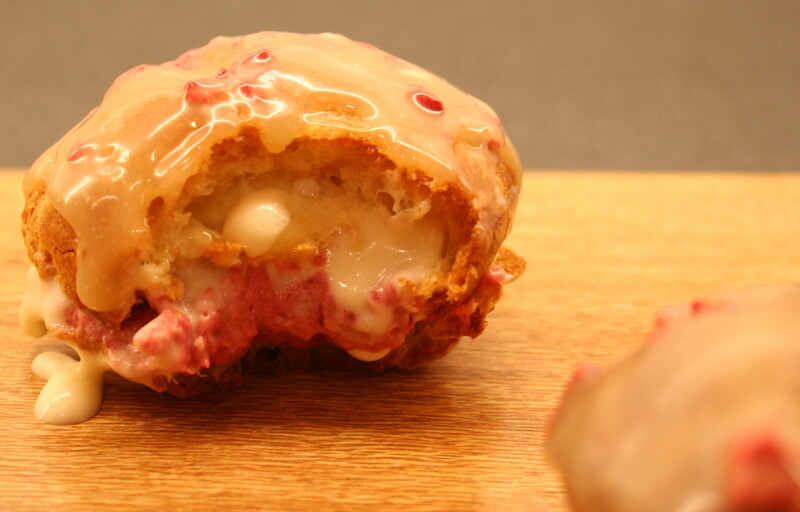 I awoke yesterday determined not to let the choux pastry defeat me – besides, the image I had in my mind of what these strawberry cream puffs would look and taste like was just too much to let go. The more I researched choux pastry recipes, the more astounded I was at how much different recipes for this simple dough vary. After much deliberation I opted to try David Lebovitz’s recipe (minus the crystal sugar and chocolate) from his The Sweet Life in Paris – which uses double the amount of flour and half as much baking time as Michel Roux’s recipe. It had to turn out differently. So last night I holed myself up in the tiny kitchen, whilst my other half screamed obscenities the Euro 2012 football quatre finals, and got baking. Despite the increased flour, this time the dough seemed a lot wetter and runnier. In piping the dough onto the baking parchment I also thought that it should be stiff enough to hold the round shape of the eventual bun – but instead it spread into a round disk. I’m not if that’s what choux pastry is meant to do – but at least this time they rose a lot better, although not as tall as I would have liked. I think the baking time recommended by Lebovitz was too much (or too much in my fan oven) as they came out decidedly crisp. But better than soggy right? Once cut open the insides were still moist and beautifully airy. This was it. Whether or not they were right, I was going to make strawberry cream puffs. 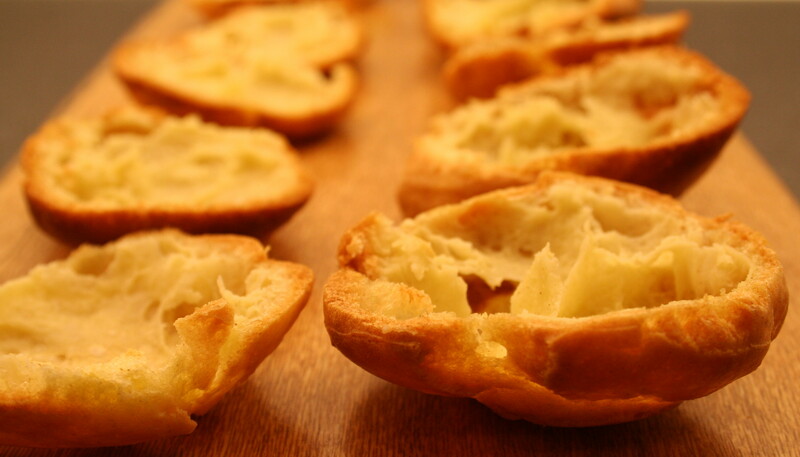 Besides, I had a bowl of crème pâtissière sitting in the fridge that I had made the night before whilst my first batch of choux puffs deflated. So I whipped some double cream till stiff peaks formed, mixed it with an equal quantity of the pastry cream and added the fragrant smelling powdered strawberries. 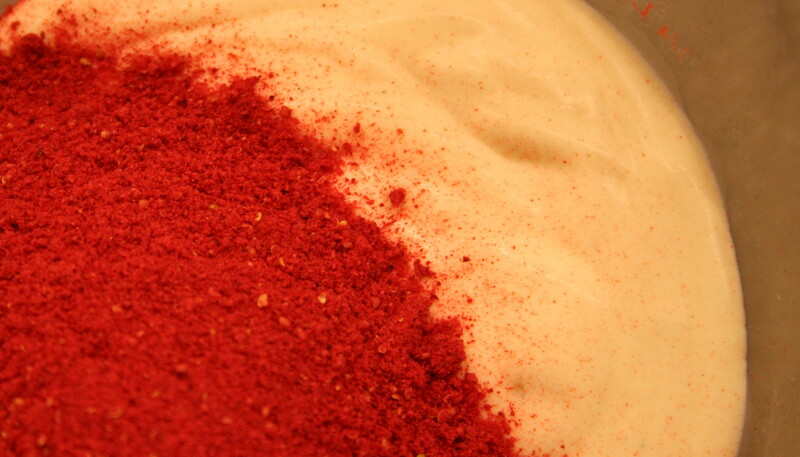 The fragrance of the mixture was that of fresh summer strawberries and cream, with a hint of vanilla. I piped the slightly tart strawberry cream onto the bottom half of the puffs, and slathered the top halves with as much of the leftover pastry cream as I could justify. The white chocolate ganache was made by melting a slab of Lindt’s white and strawberry chocolate with a little double cream. With the puffs assembled, they were devoured before the ganache even had a chance to set. They did not look how I imagined them in my head, but oh they were delicious! 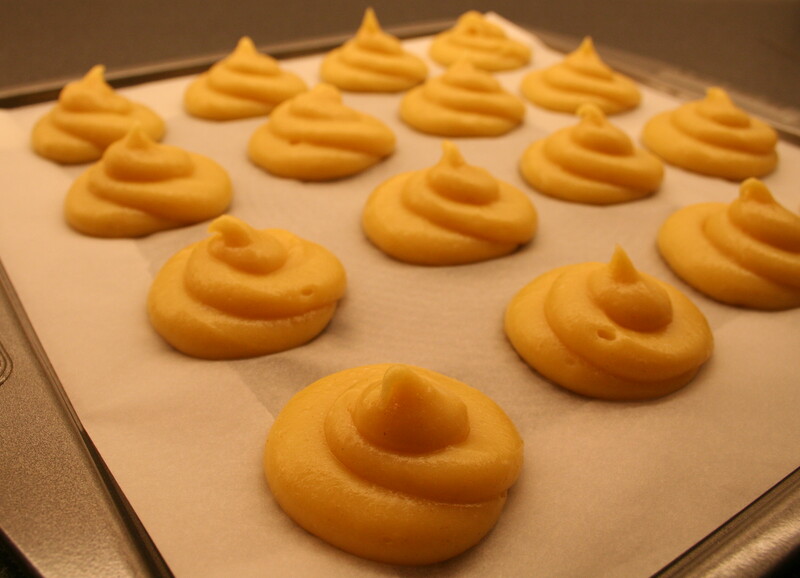 The recipe does however need refining, and I need to either find a better choux recipe – or learn how to make choux pastry better. So until I do, I won’t share the recipe. But know that when I do it will be worth it. 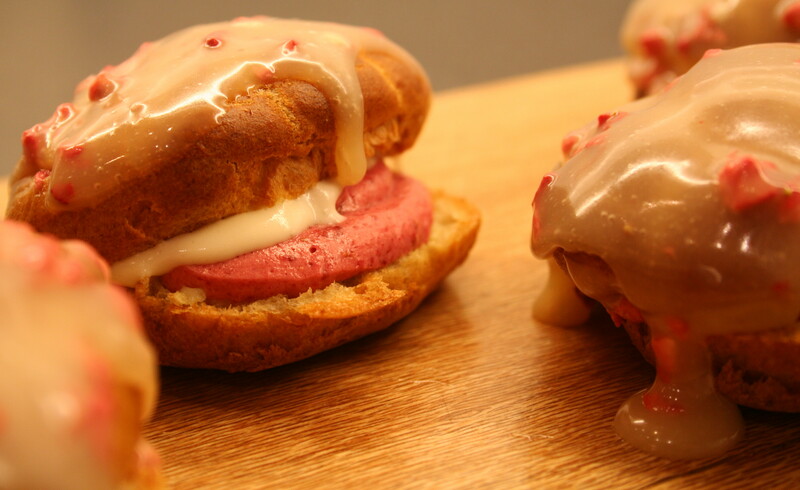 This entry was posted on Friday, June 22nd, 2012 at 21:50	and tagged with choux, choux pastry, crème pâtissière, cream, cream puffs, pastry cream, pâte à choux, strawberries, vanilla custard cream and posted in fruit, pastry. You can follow any responses to this entry through the RSS 2.0 feed. Yum, yum! If you ever wanna do this again, try a Brandteig or Windbeutel recipe. 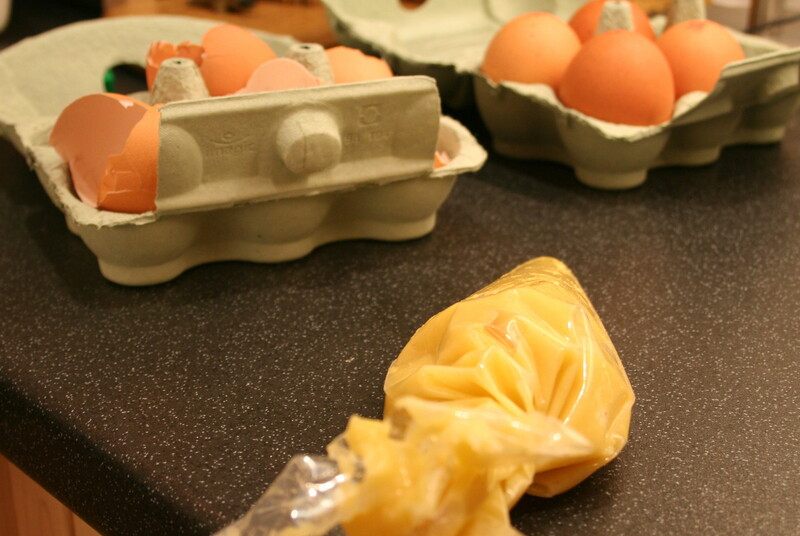 I’ve not been brave enough yet to do pastry – but I’m going to have a go now!